Nothing is like unchanging in this life. Not pain. Not peace or joy. Everything flies away. Life is a beautiful struggle. If you have grief now, take solace in remembering it cannot last forever. If you have obstacles, they can be removed. We need not add more sorrow for our present grief. On the other hand, if you are comfortable now, be wise in understanding you may not always hold what you have. If somebody is rich now, his assets can be taken away easily and wealthy condition and great prosperity are temporary. So enjoy what you have while you still have it. Stay motivated by what we earn now and Love the people you have in your life while you still have the time. We are travellers in this life. We arrive at some place and then sooner or later, we shall have to perish. We should not mourn for what we cannot regulate, but we should celebrate what we have now. It isn’t like that we should not aim to possess anything, but that we should lift our hearts to possess those things that will last for all immortality. The time is quick, that from now on, don't waste time in weeping but enjoy the life to the fullest. The bit we secure while “holding” another for our own gain becomes our instabilities. Sometimes happiness and love for others are moving on and letting go. Stay positive. Stay Live. 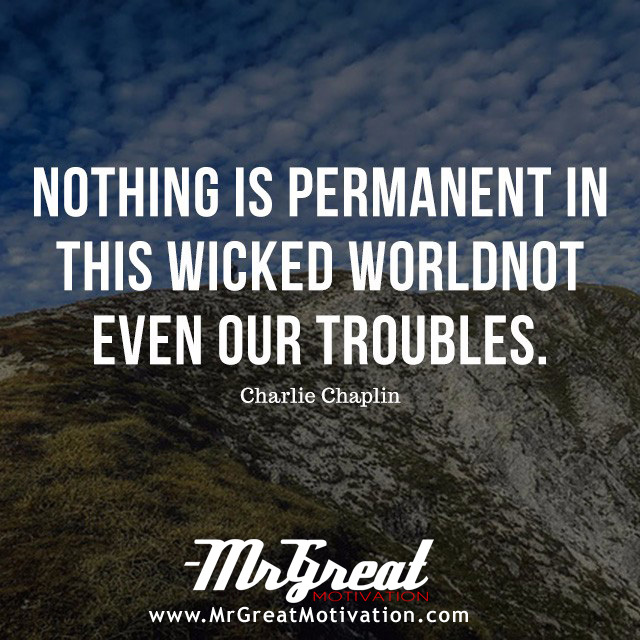 We hope guys you find Quote "Nothing is permanent in this wicked world – not even our troubles – Charlie Chaplin" by Mr Great Motivations useful. If you think we have made some efforts, then don't forgot to appreciate us by sharing this Quote with your friends and family, And thanks for visiting.